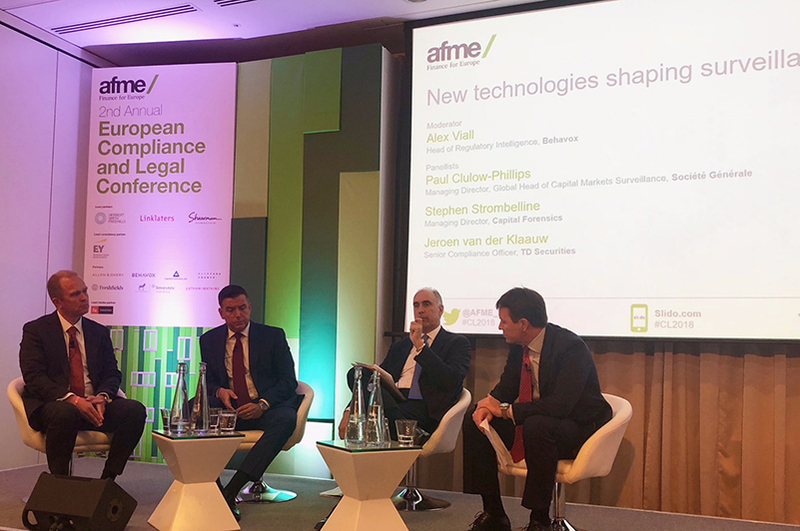 CFI Managing Director Stephen Strombelline was a featured panelist at AFME’s 2nd Annual European Compliance and Legal Conference held this week in London. The event featured leading industry authorities who covered key issues shaping the legal and compliance functions in the European financial sector. In his panel discussion on “New Technologies Shaping Surveillance,” Mr. Strombelline (2nd from right), was joined by Alex Viall, Head of Regulatory Intelligence, Behavox; Paul Clulow-Phillips, Managing Director, Global Head of Surveillance, Société Générale; and Jeroen van der Klaauw, Senior Compliance Officer, TD Securities.